The obvious answer to protect your eyes! Do accidents happen on court? You bet! Just in our St. Louis club alone, two players have been hit in the eye in recent years, one with a shuttle and one with a racket. In one St. Louis venue, we play under extreme white-out conditions with a low ceiling and bright lights. The eye injury results ranged from weeks of homebound recovery and missed school for one player to eye surgery and diminished vision for the other. Both may suffer from potential detached retinas in the long term. My friendship with protective eye wear began about a decade ago when I decided to try a pair. As players age, reflexes show down and if you play against younger players, they do hit the shuttle quickly. Mixed doubles is my favorite event, and a female player is close to the net which could endanger eyes. Female players are often the targets of an opponent’s cross court smash in mixed doubles all the more reason to protect your eyes. To complicate the matter, many senior women only seem to lift mid-court to the opponent. Some players hit the shuttle hard but have little control over where it goes another good reason for protective eye wear. In addition, aggressive new players often have no thought of a doubles partner and swing the racquet in an unpredictable manner. However, if you want the feeling of NO FEAR, just try a pair of protective goggles they do give you the option of taking risks you might not try if you had no eye protection. If you Google on badminton eye injuries, you’ll find all kinds of information on eye injuries caused by our favorite sport. Most of the research on badminton injuries comes from England, its former colonies, and the Scandinavian countries. According to those studies, the most dangerous traumatic injury that can occur in badminton is an injury to the eye. A Malaysian study called badminton the sport that presented the greatest ocular hazard in that country. A Canadian study published in the Physician and Sports Medicine Journal found that badminton accounted for 30% to 58% of all racquet sport eye injuries in Canada in a decade. In 2005, the Ontario Badminton Association legislated the mandatory use of protective eye wear for all juniors. 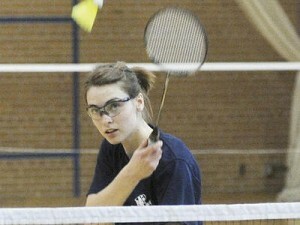 The research went on to say that seventy percent of all badminton-related eye injuries happen during doubles games. The person most at risk would be the net person who gets hit in the eye by the shuttle or gets hit by the racket or shuttle of his/her partner. Most players have heard the warning to never look back during play so that you do not get hit in the eye with a shuttle coming from your partner. All the research recommends the use of polycarbonate plastic glasses while playing badminton. It used to be believed that only beginning players were prone to injury because they don’t keep their eye on the shuttle at all times, but research has shown that very experienced players can be injured as well. Several studies pointed out that while there are more eye injuries in squash, the injuries from badminton tend to be more severe. Most players are aware of the speed of that shuttle at nearly 200 miles an hour even though it doesn’t look like a deadly weapon. The fact that a shuttle looks like it couldn’t kill a fly is a big reason why there is a lack of awareness among badminton players about the potential for eye injury. So our club has taken heed of the dangers of the shuttle, and we have seven players who pull out their protective eye wear when they play. Goggles can be found on line, at many tennis shops, racquetball facilities, and other places where racket sports are played. The new wrap-around goggles do not interfere with your peripheral vision so it’s just like wearing a pair of glasses. Try a pair you might be surprised and you’ll be a lot safer on court! Giant Shuttles in the United States?